What. Along with discovering one of the most oddly beautiful and best-kept corners of the Alt Empordà, dotted with menhirs, dolmens and megalithic constructions, you will learn about the surprising uses and properties of the plants that give the region its olfactory personality. While there you will use them to prepare your own, personal off-road fragrance. 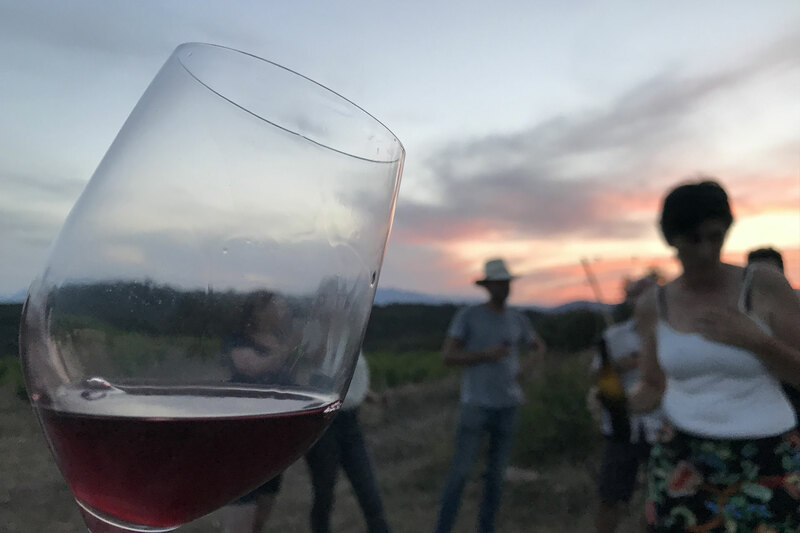 What is more, you will enjoy a wine tasting with products made ecologically in those very vineyards, listening to a thousand stories about the wine from the producers themselves. Who For. For all those who would like to have the experience of gathering plants with us, your hands alive with the scents of our most emblematic varieties, yet without getting tired or spending an entire day. For anyone from 8 to 88 years old. Includes. A pleasant walk to gather plants lasting almost an hour and a half in the Gutina reserve, the habitual working area of Bravanariz. Afterwards, we will do the wine tasking with the owners of Celler la Gutina hosting us amongst their vineyards, complemented by a selection of cheeses and other delicious local products. Then we will distil the plants and make a off road capture Clearing Mist (Hydrosol) of the experience. Route. Circular route covering the most important megalithic remains on the property (5 km). Low difficulty, negligible slope. Meeting point. We meet directly at the route’s starting point, in the manor house of Can Torras (Celler la Gutina). When we start. At 9 am, distribution of material and brief explanation. At 9.30 am we get on our way. What you need. Curiosity and a good attitude, along with a sun hat, sunscreen and comfortable footwear. The rest is on us: a basket and pruning shears, gloves, fresh water, wine and other delights. Oh, and an important recommendation: don’t come wearing perfume or cologne. This may seem obvious, but it is worth reminding you. Keep in mind that some shampoos, conditioners and deodorants that have been synthetically scented are so ‘effective’ that the cloud of falsely-derived pleasant scent surrounding you will not let you and the others truly enjoy the experience. Group size. From 6 to 12 people.